This hobby machine perfectly complements other cutting tools. The Silhouette Curio™ hobby machine is the perfect complement to Silhouette's other cutting tools, the Silhouette Portrait® and Silhouette CAMEO®. Simply connect the Curio to your PC or Mac with the included USB cable and use the included software, Silhouette Studio®, to design your project. Then send your project to the Curio to put your signature style on countless DIY projects. Curio is the perfect machine for DIYers that love to diversify their creativity. Curio is driven by powerful Silhouette Studio® software as well as the Silhouette Design Store, a marketplace of over 70,000 ready-made designs available for purchase. Find the perfect design, resize and customize the design for your project, or design your own from scratch using hundreds of design tools in the powerful Silhouette Studio® software. Q: Is the Curio meant to replace my Portrait, CAMEO, or other Silhouette electronic cutting tool? cutting surface*. We have no plans to discontinue our Portrait or CAMEO cutting tools. *Requires optional Curio large base for maximum cutting area capability. Q: How big is the Curio’s workspace? with the Curio provides a maximum work space of 8.5 inches by 6 inches. Q: Does the Curio have Print & Cut capability? A: Yes! The Silhouette Curio™ includes an optic scanner that can read and utilize registration marks for Print & Cut jobs. Q: Is the Curio PixScan™ compatible? A: The Curio will have PixScan™ compatibility in fall of 2015. Q: What can a Curio do that a CAMEO, Portrait, or other Silhouette electronic cutting tool can’t? Q: Can I cut fabric with my Curio? 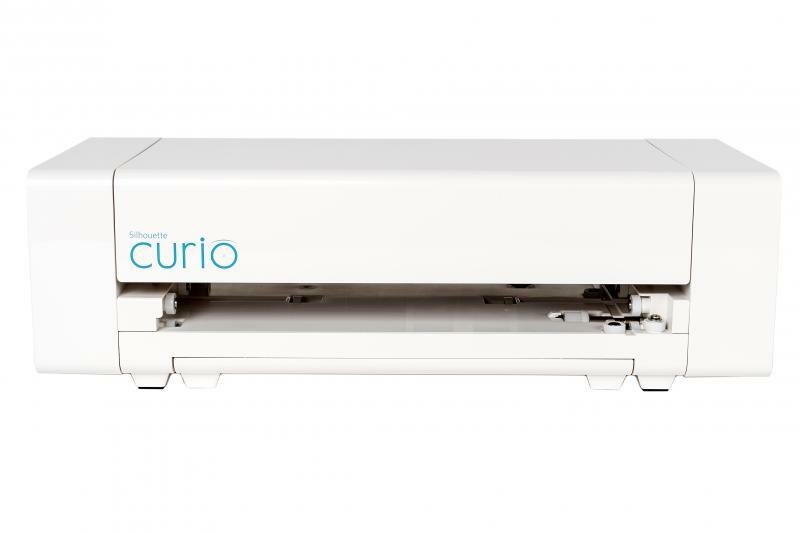 A: Similar to other Silhouette cutting machines, the Curio can cut fabric when using fusible fabric stabilizers. Q: Can I cut straight from a roll of media with my Curio? A: No. The Curio requires a hard base when cutting and has a limited cutting area. Q: What types of metals can the Curio etch? we are able to provide. A: Stippling is the process of creating a design using a series of dots. The Curio provides the capability to produce stippling effects. This can be achieved with either a felt tip pen to draw stipple points or the stippling tool to punch a series of stipple points. Q: What is the maximum cutting force of the Curio? A: When used under normal cutting conditions, the Curio provides 210gf cutting pressure. Q: Can I use Curio accessories in my Portrait, CAMEO, or other Silhouette electronic cutting tool? recommend using the deep-cut blade, stippling tool, engraving tool, or embossing tools with machines other than the Curio. Q: Which tools and accessories are compatible with Curio? A: The Curio is compatible with all current tools and accessories offered, such as regular blades and sketch pens. Q: Is the Curio quieter than other Silhouette machines? Q: What kind of material surfaces can be embossed? Score & Emboss paper. Other material types can be embossed through trial and error. 8.5 in. x 6 in.